Generates up to 90% increase in holding capacity over stock systems. 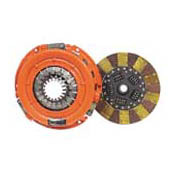 This clutch/disk set is designed for use with engines producing high horsepower and torque output, and any radically altered high performance street vehicles. This system is also ideally suited for use with four-wheel drives using tall tires. This clutch is garbage! This centerforce co. is a sloppy mfg of critical, very time consuming, costly components. My clutch does not release now and have to jam into 1st gear and mesh the rest. Now I have wasted about 3 days of my life on this foolish purchase. one day to install, one day to remove and one to pay the toilet. Who knows what else may have occured due to junk clutch binding. These companies got it so easy, just put a fake worthless minimum warranty on something we can screw you on and we have your money. Faulty weight system makes engine run out of balance. I recently completed a 6 year build on a 1970 Trans Am. All engine parts were completely balanced yet I would get a substancial vibration starting at 2700 RPM and increasing from there. It was not in the drivetrain because it was RPM related and would do it sitting still in the driveway. After ruling out any engine accessories or balancer issues, I pulled the trans and bellhousing and there it was. All the weights were slung offset to one side of the pressure plate fingers. There isn't anything to keep the weight ring from staying centered and the whole Center-Farce weight system is a big sloppy mess of a design. Imagine your engine's driveshaft wearing a weighted hula hoop! Took the clutch off and smooth as glass. I'm glad it didn't destroy my engine first. Fortuately, I didn't drive it that way. Hope this helps anyone else having the same vibration issues or thinking about using a CenterForce clutch with the ill designed weight system. My opinion....STAY AWAY FROM CENTER-FARCE. I've been happy with this clutch as it has great pop/snap off the line. I don't have monster power so I have been problem free unlike these other reviewers here. purchased clutch on line from a web site selling only centerforce. put the clutch in myself at one of those u-fixit centers in phoenix(they were great)got the clutch in and it starting chattering at low speed and major pedal vibration,Keep in mind I had the fly wheel resurfaced by clutch doctors. So I took out the clutch again and sent it back to centerforce. they said the chater was from the transmission and that I had damaged something on install and they fixed it for free for me. Sounds fishy doesn't it. how many companies fix stuff for free when you damage it. so I put the Clutch back in and the chatter suddenly disapeared although the the vibration has yet to go away. It is just not as heavy. I would not recomend this product to anyone . I had to spend extra money and my time to take care of this and it is still not fixed to my standard which is perfect.the company never took any responiblity for their messup. instead they blamed me and fixed it anyways OK!!!!!!!!!!!!!!!!!!! right. STAY AWAY FROM CENTERFORCE!!!!!!!!!!!!!!!!!!!!!!!!!!!!!!! I spent extra money sending this back and forth to them and extra money to rent the space and tools to put it in. it cost me a total of just over $780 to put it in twice and for see extra costs in the future to get the vibration fixed. I hope this helps the consumer and hurts centerforce. bad customer service. after many passes at the track with my 500hp stang with slicks on it launching at 5500rpm and tons of street driving it finally started to slip but u can tell the weight system works because at high rpm the slip would stop.ive never had a clutch hold this long when using slicks at the track.i have used many other clutchs like a ram clutch that lasted one day and 5 passes,any that says this clutch is crap eaither didnt install it right or cant drive and thats the truth. Thsi clutch has a weight system on the fingers which is junk. On the clutch I installed, the clip that holds the weight broke in the first 300ft. The clutch stuck open and was not under warranty as I purchased it a year earlier. STAY AWAY FROM THIS TYPE OF CLUTCH... THE WEIGHT SYSTEM IS TOO WIMPY FOR A PERFORMANCE APPLICATION!!! This Clutch is the only clutch that will ever go in another one of my vehilces. Holding capacity is amazing and they've got more capcity than a hays by far. And there's no comparision to a stock ford clutch. My truck has a 245 bone stock V6 and it'll chrip em 1 through 3. i was lucky to get 2nd gear rubber going around a corner with the stock clutch. It was installed by a ford dealer and chattered pretty bad for a week because they got some grease on it which isn't a hard thing to do. but other than that i havn't had a single problem with it. granted i don't rod the living hell out of my truck very often but it has got me out of a few jams. Not a whole lot I've burnt it twice which was my own fault 6" of mud in 2wd=damn stuck and that's how i burnt it. and if that's a weekness then that's the only one i've seen in the 2 years and 25000 miles it's got on it. Overall this is probably the 2nd best. (their dfx is probably the best) It's worth every penny. anybody that gives this clutch a 1 either has a moron install it needs to get an auto because they don't know how to shift or they're stupid and rod the hell out of their vehicle. Stock clutch 2 friends have hays clutchs that are absolutely worthless. MUCH SNAP! Can you say holeshot? Wrong application for me. Wouldn't be good for off road either. I bought this clutch for my Blazer to compliment a new Vortec 350 I had installed at the same time. I may have made a mistake choosing this clutch though. Like any one else here that installed it properly I noticed right away it really grabs hard! You can't slip the clutch even if you try. At first I thought it was out of adjustment. Not the case. This truly is a high performance clutch. I would rather have something a little more tame since I tow dirt bikes on occasion. In my truck its either you let the clutch out without giving it ANY gas, it will bog a little but it takes off civilized, or let it out and no matter how little gas you give it it will light up the tires (33"s). It makes me look like an @ss hole at times. It will make most people happy though. I should have done my homework. No fault of the clutch its doing its job. I no longer have my Z, but I had this clutch put in by "professional car and truck" or something. It was a nice place, pretty spacious, and they had a good price on installation. I always worry when taking my car in for anything. I got the car back and the damn thing chatters. Like it bites and lets go very quickly, but doesnt happen so much when warmed up. I cannot tell if it is the clutch or poor labor. Maybe I'll get a Motorcraft is the Aspire's go out.